It’s autumn, two Blackfeet hunters have come to this wilderness outpost with a prime painted buffalo robe and an elk hide to trade for powder and ball. 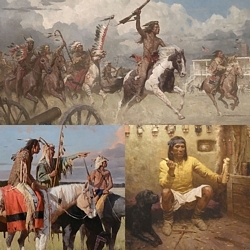 White men drawn to the frontier were quick studies and adept survivors. The man holding the robe runs this Musselshell Valley trading post. He negotiates with the few words of Blackfeet he speaks and sign language. He has also surrounded himself with other fundamental tools of negotiation for this part of the world. Next to him stands a large and robust woodsman whose physical power could be crucial in this dangerous environment. Sitting on the wooden barrow is a well experienced hunter. In his arm, a loaded gun and a pistol in his belt are ready for any sudden threat. Safety is not the concern of these Blackfeet men, trade is. Both hunters are wearing capotes that have been made from Hudson Bay Company blankets. The older of the two leads their side of the negotiation. From his body language it is apparent that he has had experience in trading with the white people. His less experienced partner waits quietly and carefully observes. A painted hide could trade for five times the value of a regular hide. This was not only a result of the artwork that adorned it but also because the best hides was the ones chosen for this treatment. He is doing his best to carefully communicate the value of this robe, hoping to make a good deal. Fall is an important hunting season and the additional ammunition this trade can secure will help to provide enough to eat for the long cold Montana winter ahead. "Painted Robe for Powder and Ball, Musselshell Valley, (Montana), 1840" was unveiled at the Coeur d’Alene Art Auction in 2009. The enormous painting (42" x 64") was the talk of the show and sold for $345,000.00!